Woodard’s American Nations resembles David Hackett Fischer’s Albion’s Seed: Four British Folkways in America—his four folkways corresponding to Woodard’s Yankeedom, Tidewater, Midlands and Greater Appalachia, but the books do not overlap. Most of the 902 pages of Albion’s Seed are devoted to a detailed account of the customs and social structure of the original Puritan, Cavalier, Quaker and Pennsylvania settlers. The 326 pages of American Nations deal with the broad sweep of American history and also include sidelights on Canadian history. Both Fischer and Woodard think that the regional cultures (except for First Nation) were established by the first European settlers. They are important numerically, Woodard wrote; roughly half the inhabitants of the United States are descended from North Americans who came before 1790. They created institutions and rules to which later immigrants conformed. The regional cultures he lists definitely exist. 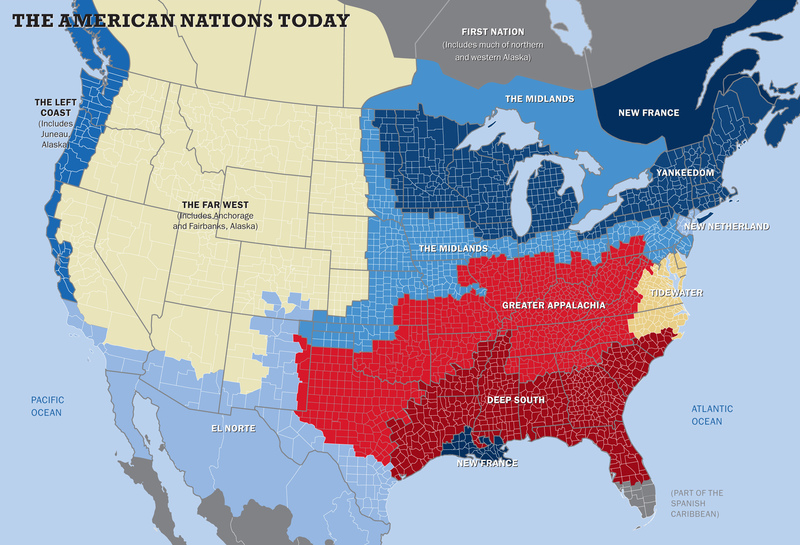 New England Yankees, Southerners, Westerners, New Yorkers, Louisiana Cajuns, ethnic Mexicans along the border, French Canadians and the American Indian nations all have identities they can take pride in. The only nation whose existence I question is the strangely-shaped Midlands region. I doubt if any Americans or Canadians think of themselves as proud Midlanders. Regional conflict since the Civil War, according to Woodard, has been mainly between (1) a Southern Alliance, consisting of the Deep South, Greater Appalachia and, until recently, Tidewater, and (2) a Northern Alliance consisting of Yankeedom, the Left Coast and, more recently, New Netherland. 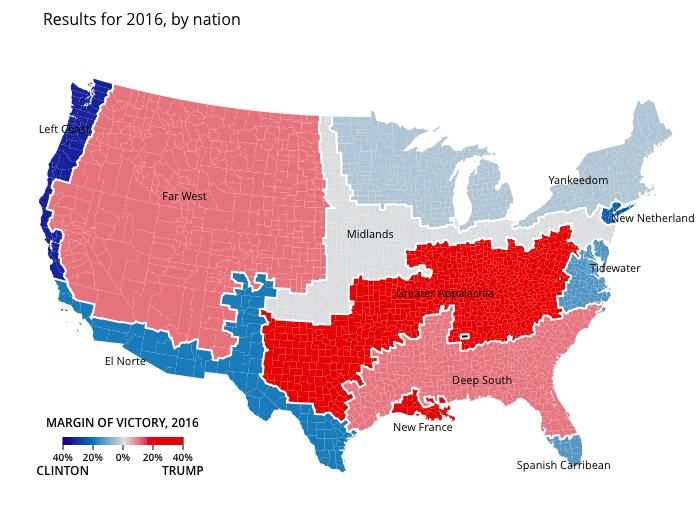 The Midlands, the Far West and El Norte hold the balance of power. The regional alliances are in conflict over economic policy, foreign policy and cultural issues. The economic policy of the Southern Alliance is to attract wealth based on low taxes, lenient regulation, low wages and exploitation of natural resources. The economic policy of the Northern Alliance is to foster industry based on an educated work force and extensive public services. The Southern Alliance is patriotic and warlike, Woodard wrote; pacifist and anti-imperialist movements are originate in the Northern Alliance and the Midlands. The Southern Alliance is committed to what Woodard called “private Protestantism,” which believes in tradition and holds people are saved from sin only as individuals. The Northern Alliance is committed to “public Protestantism,” which believes in progress and holds that society as a whole must be saved collectively. The maps below illustrate political loyalties among the regions in the last three Presidential elections. Disaggregated by county, the regional divisions seem less stark and the boundaries between them less clear. The map above is the 2008 results, the map below is the 2016 results. 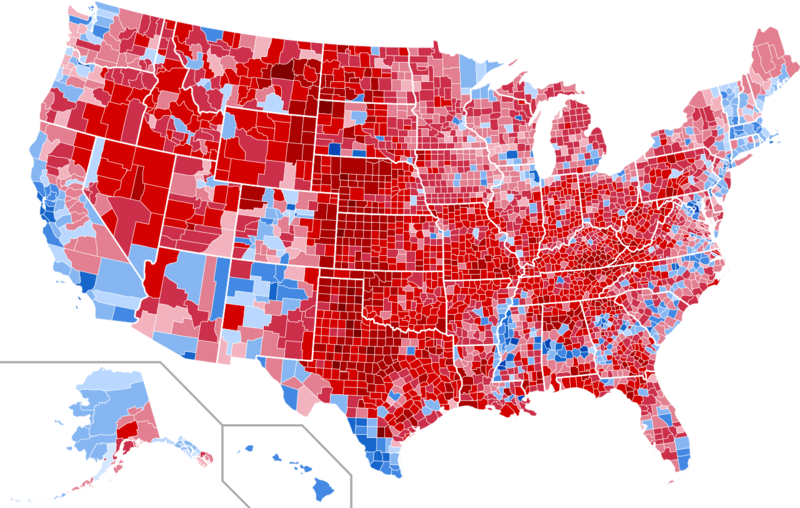 Blue represents counties won by Democrats, blue by Republicans; the intensity of the colors reflects the size of the majorities. I have some criticisms of Woodard. He overlooks one of North America’s most important cultures, the African-American culture, simply because it is not dominant in any important geographic area. But African-Americans are culturally distinct from the 11 regional cultures, and, in some regions, hold the balance of power. Without the African-American vote, Democrats would only win in Yankeedom and the Left Coast. He has a mistaken idea of what a nation is. French-Canadian Quebec may be a nation. El Norte may be the nucleus of a future nation. 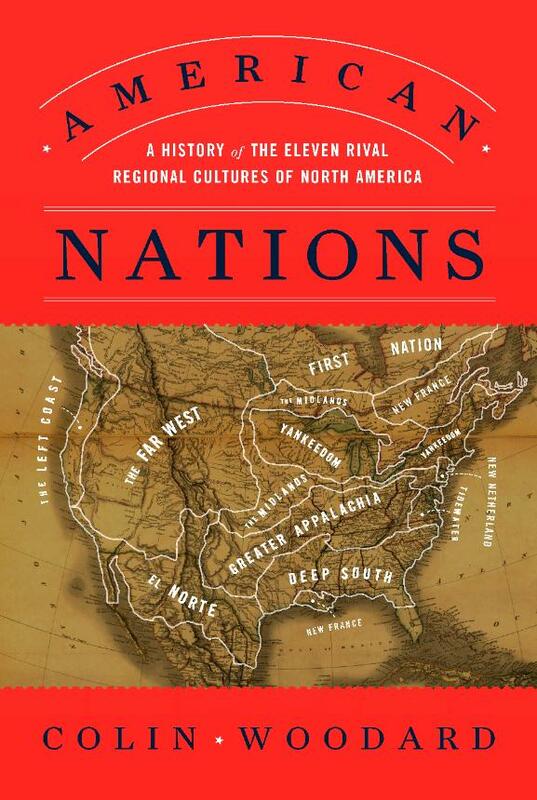 Greater Appalachia, Midlands and Yankeedom are not nations. I will say more about this in future posts. Voting behavior is not determined by regional identity alone. If it were, the only thing that would affect the outcomes of elections would be birth rates and migrations. Public policy is not determined by election outcomes alone. Otherwise the U.S. would not be at war, and would not put Wall Street bankers in charge of economic policy, no matter which party is in office. American Nations: the official homepage of Colin Woodard. How Colin Woodard’s ‘American Nations’ explains the 2016 elections by Colin Woodard for the Portland (Maine) Press-Herald. American Nations Series by JayMan. JayMan has collected maps and charts to illustrate his contention that the differences among Woodard’s American nations and Fischer’s four folkways have a genetic basis. I do not think this is a fruitful hypothesis, but he has collected an enormous amount of information worth knowing. 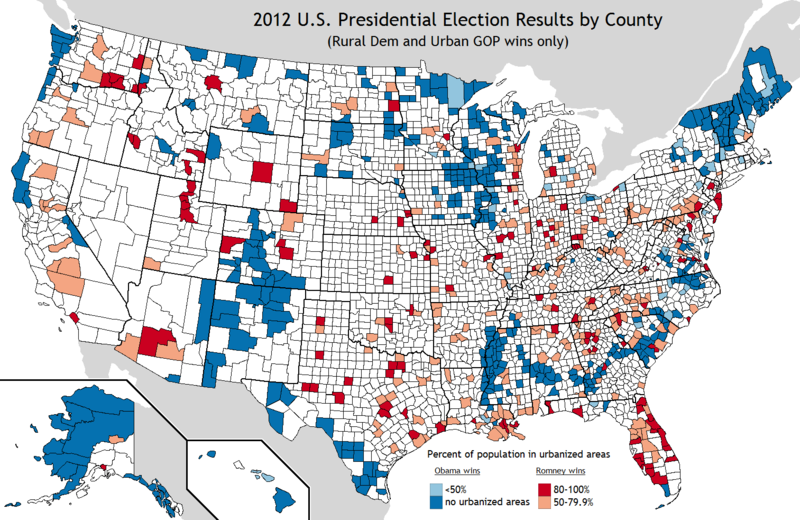 The next shows the locations of rural counties carried by Barack Obama and urban counties carried by Mitt Romney in 2012. This entry was posted on July 29, 2017 at 1:43 pm and is filed under Books, Geography, History, Politics. You can follow any responses to this entry through the RSS 2.0 feed. You can leave a response, or trackback from your own site. I think marketing, movies, television– mass communication, have a large influence on modern society. Who rules the media? A related question to this topic is: What is/are American nationalism(s)?